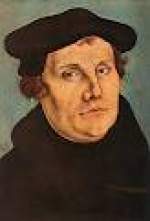 1521 Martin Luther appears before the Diet of Worms to face charges stemming from his religious writings. Khrushchev was born in 1894 into a poor family near Kursk in south-western Russia. He received very little formal education. He joined the Bolshevik Party in 1918 and served in the Red Army during the Russian Civil War. The speech initiated a campaign of 'de-Stalinisation'. Khrushchev also attempted to improve Soviet living standards and allow greater freedom in cultural and intellectual life. In the mid-1950s, he launched his 'Virgin Lands' campaign to encourage farming on previously uncultivated land in the Kazakh Republic (Kazakhstan). He invested in the Soviet space programme, resulting in the 1957 flight of Sputnik I, the first spacecraft to orbit the earth. 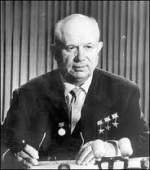 In relations with the West, Khrushchev's period in office was marked by a series of crises - the shooting down of an American U2 spy-plane over the Soviet Union in 1960, the building of the Berlin Wall in 1961 and, most significantly, the Cuban Missile Crisis in 1962, which brought the world to the brink of nuclear war. Despite this, Khrushchev also attempted to pursue a policy of co-existence with the West. This change in doctrine, together with Khrushchev's rejection of Stalinism, led to a split with Communist China in 1960. Lys: The German drive is halted after gaining only 10 miles including the Messines Ridge. Ludendorff achieves tactical success, but a strategical failure. There is no breakthrough, and the Channel ports are safe. 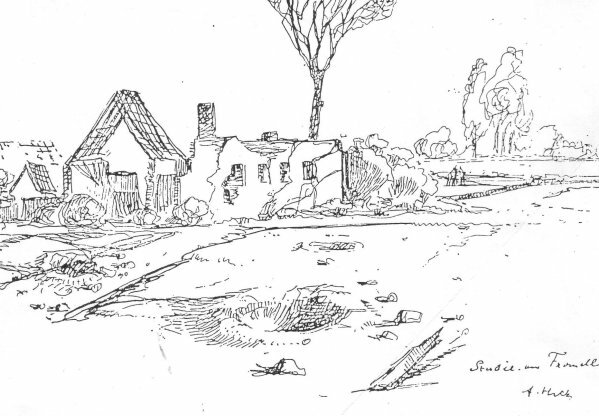 Night of 16-17 April; terrible artillery fire. Heavy gas bombardment around morning. Severe losses. In the evening, we marched to the most forward line with only 40 men [left] . . . . We got lost and ran into heavy artillery fire. 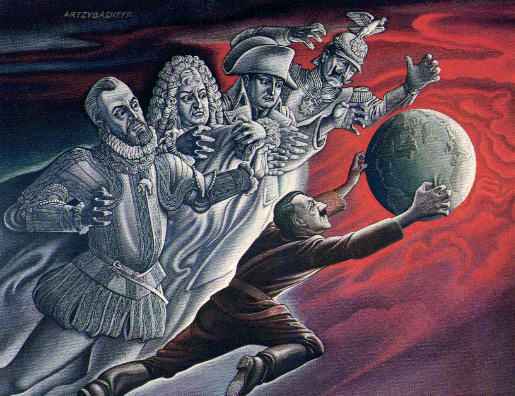 1935 Rearmament: The League of Nations censures Germany's policy. 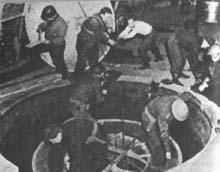 The rearming of the Air Force required, as a basic condition, the creation of a large number of new industries. It was no help to me to build a strong Air Force and not to have any gasoline for it. Here, too, therefore, I had to speed up the development of the refineries to the utmost. There were other auxiliary industries, above all, aluminum. Since I considered the Luftwaffe the most important part of the Wehrmacht—as far as the security of the Reich was concerned, and in view of the modernization of technical science—it was my duty as Commander-in-Chief to do everything to develop it to the highest peak. As nothing was there to begin with, a supreme effort and a maximum amount of work had to be achieved. That I did . . . . I did everything possible under the technical and production conditions then prevalent, to rebuild and rearm a strong Air Force. The technical knowledge of that time led us to believe that, after 5 years of war, new technical and practical advances would be made. That is a principle based on experience. I wanted to be prepared to have an Air Force which, however the political situation might develop, would be strong enough to protect the nation and to deal blows to Germany's enemy. It is perfectly correct for Mr. Justice Jackson to ask whether the speedy elimination of Poland and France was due to the fact that the German Air Force, acting according to modern principles, contributed so much. It was the decisive factor. On the other hand, though this does not concern me, the use of the American air force was also a decisive factor for the Allied victory. 1938 Romania: An attempted coup by Fascists and the Iron Guard is smashed by the government. Many of the instigators are arrested. The Russian Ambassador visited me today, for the first time since he took up his post here (June 5, 1938) for a conversation on practical matters. 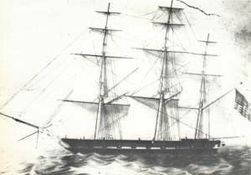 He dwelt at length on a subject which he said was of particular interest to him, namely, the fulfillment of certain contracts for war materiel by the Skoda Works. Although the items involved are manifestly rather insignificant, the Ambassador regarded the fulfillment of the contracts as a test, to determine whether, in accordance with a recent statement by Director Wiehl (Head of the Commercial Policy Division of the German Foreign Office) to him, we were really willing to cultivate and expand our economic relations with Russia. The matter of these supply contracts is being looked into elsewhere. Toward the end of the discussion, I casually mentioned to the Ambassador that even granted goodwill on our part, a favorable atmosphere for the delivery of war materials to Soviet Russia was not exactly being created at present by reports of a Russian-British-French air pact and the like. Herr Merekalov seized on these words to take up political matters. He inquired as to the opinion here regarding the present situation in Central Europe. When I told him that as far as I knew Germany was the only country not participating in the present saber-rattling in Europe, he asked me about our relations with Poland and about the alleged military clashes on the German-Polish frontier. After I had denied the latter, and made some rather restrained comments on German-Polish relations, the Russian asked me frankly [unverblumt] what I thought of German-Russian relations. I replied to Herr Merekalov that, as everybody knew, we had always had the desire for mutually satisfactory commercial relations with Russia. It had appeared to me that the Russian press lately was not fully participating in the anti-German tone of the American and some of the English papers. As to the German press, Herr Merekalov could form his own opinion, since he surely followed it very closely. The Ambassador thereupon stated approximately as follows: Russian policy had always moved in a straight line. Ideological differences of opinion had hardly influenced the Russian-Italian relationship, and they did not have to prove a stumbling block with regard to Germany either. Soviet Russia had not exploited the present friction between Germany and the Western democracies against us, nor did she desire to do so. There exists for Russia no reason why she should not live with us on a normal footing. And from normal, the relations might become better and better. With this remark, to which the Russian had led the conversation, Herr Merekalov ended the interview. He intends to go to Moscow in the next few days for a visit. It has been my opinion from the outset that special conditions prevailing in the annexed eastern territories require special measures of penal law and penal procedure against Poles and Jews . . . . The aim to create a special law for Poles and Jews in the eastern territories was pursued further according to plan by the ordinance dated 6 June 1940. 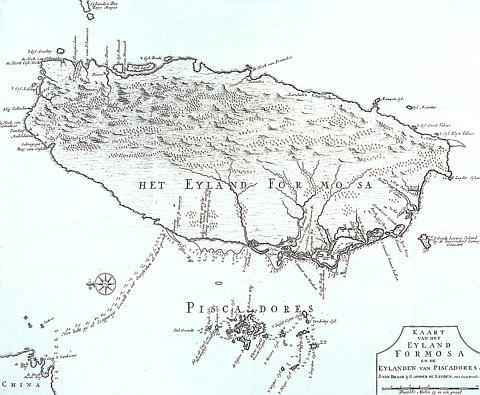 By this ordinance German penal law, which had been used in the eastern territories already from the outset Divas formally made applicable . . . . The procedure for enforcing a prosecution has been abrogated for it seems intolerable that Poles or Jews should be able to force the German public prosecutor to launch an accusation. 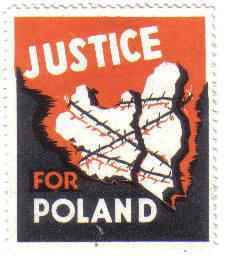 Poles and Jews have also been deprived of the right to prosecute in their own names or join the public prosecutor in an action. In addition to this special law in the sphere of procedure, some special conditions have been included in Article 2 of the introductory ordinance. These provisions were established in agreement with the Reich Minister of the Interior by reason of requirements which had arisen. From the beginning it was intended to augment the special conditions in case of need. This need, which had become apparent in the meantime, should be met by an executive and supplementary order to be added to the original ordinance and which was referred to in the letter from the Deputy of the Fuehrer . . . . After I was informed of the express wish of the Fuehrer that, as a matter of principle, Poles and presumably the Jews, too, are to be treated differently from the Germans within this sphere of penal law, after preliminary discussions, etc., I draw up the enclosed draft concerning criminal law and procedure against Poles and Jews . . . . The draft represents altogether special law, both in the sphere of penal law and penal procedure. The suggestions of the Deputy of the Fuehrer have been taken into consideration to a far reaching extent. Number 1, Paragraph 3, contains a general crime formula on the basis of which any Pole or Jew in the eastern territory can in future be prosecuted and any kind of punishment can be inflicted on him for any attitude or action which is considered punishable and is directed against Germans . . . . In accordance with the opinion of the Deputy of the Fuehrer, I started from the point of view that the Pole is less susceptible to the infliction of ordinary imprisonment . . . . Under these new kinds of punishment prisoners are to be lodged outside prisons in camps and are to be forced to do heavy and heaviest labor . . . . The introduction of corporal punishment, and that is either as penal punishment or as disciplinary measure, which the Deputy of the Fuehrer has brought up for discussion, has not been included in the draft. I cannot agree to this type of punishment because its infliction does not, in my opinion, correspond to the cultural level of the German people. During World War II, representatives of Yugoslavia's various regions sign an armistice with Nazi Germany at Belgrade, ending 11 days of futile resistance against the invading German Wehrmacht. More than 300,000 Yugoslav officers and soldiers were taken prisoner. Only 200 Germans died in the conquest of Yugoslavia. On March 27, 1941, two days after the Yugoslav government signed a controversial pact with the Axis powers, Yugoslav air officers, aided by the British secret services, toppled the country's pro-Axis regime. In response, Nazi leader Adolf Hitler launched a massive invasion of the country that began on April 6 with the bombing of Belgrade. The Yugoslav defenders, made up of various politically unstable nationalities, were routed by the hordes of German, Italian, Hungarian, and Bulgarian troops invading their country. Igor Sikorsky accomplishes the first successful manned heliocopter (helicopter) lift-off from water near Stratford, Connecticut. His dogged determination and faith in his own ability to build what many considered to be an impossible vehicle established the bedrock upon which today's helicopter industry rests. Military contracts followed the success of the VS-300, and in 1943, large-scale manufacture of the R-4 made it the world's first production helicopter. The R-4 was followed by a succession of bigger and better machines and since then, the helicopter has clearly established its ability to perform a myriad of difficult missions, including the saving of thousands of lives, in both peace and war. Mr. Sikorsky was especially proud of the helicopter's life saving ability and of organizations such as the Aerospace Rescue and Recovery Service which had put helicopters to what he believed was their finest use. During his career, he rarely passed up an opportunity to stress this role or praise the men whose skill and courage made the rescues possible. The pilots of rescue helicopters have contributed "one of the most glorious pages in the history of human flight. Stars and Stripes: The first issue of a new US Army weekly newspaper, is published in London. 1944 World War II: Italy Marshal Pietro Badoglio's Cabinet resigns, and he is invited to form a new government. 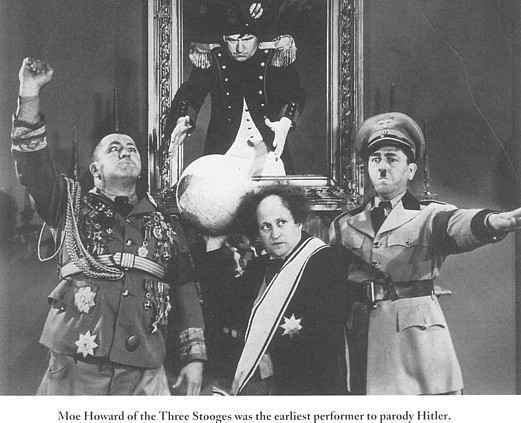 Popular Jewish-American comics as Goering, Goebbels, and Hitler. Espionage: In Strassfurt, Germany, U.S. Lieutenant Colonel Boris T. Pash seizes half a ton of uranium, in an attempt to foil Soviet Union plans to build an atomic bomb. Poland: Stalin to Churchill: Mikolajczryk's statement represents of course a great step forward, but it is not clear whether Mikolajczryk also accepts that part of the decisions of the Crimea Conference which deals with the eastern frontiers of Poland. I should be glad, first, to receive a full text of Mikolajczryk's statement, and, secondly, to receive from Mikolajczryk an explanation as to whether he also accepts that part of the decisions of the Crimean Conference on Poland which deals with the eastern frontiers of Poland. 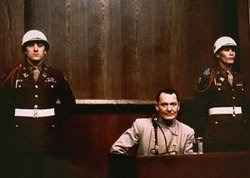 Nuremberg's influence on world politics is of a high order, both now and in the long term . . . . It is undoubtedly a dim but growing awareness that we have deeply committed ourselves to the Nuremberg principles by undertaking to judge men under them and punish men for their violation that explains the comment one so often hears today that "Nuremberg has established a dangerous precedent." 1975 Cambodia: Phnom Penh falls to Communist insurgents, ending a five-year civil war.